This is a scalable context timeline. It contains events related to the event 1998: Information on Hijacker Hanjour Apparently Ignored by FBI. You can narrow or broaden the context of this timeline by adjusting the zoom level. The lower the scale, the more relevant the items on average will be, while the higher the scale, the less relevant the items, on average, will be. Future 9/11 hijacker Hani Hanjour begins associating with an unnamed individual who is later mentioned in FBI agent Ken Williams’s famous “Phoenix memo” (see July 10, 2001). Hanjour and this individual train at flight schools in Arizona (see October 1996-December 1997 and 1998). Several flight instructors will later note that the two were associates and may have carpooled together. They are known to share the same airplane on one occasion in 1999, and are at the school together on other occasions. The unnamed individual leaves the US in April 2000. 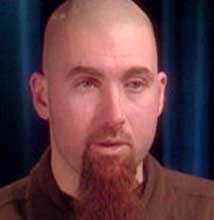 In May 2001, the FBI attempts to investigate this person, but after finding out that he has left the US, it declines to open a formal investigation. The person’s name is not placed on a watch list, so the FBI is unaware that he returns in June and stays in the US for another month. By this time, he is an experienced flight instructor who is certified to fly Boeing 737s. The FBI speculates he may return to evaluate Hanjour’s flying skills or provide final training before 9/11. There is considerable circumstantial evidence placing this person near Hanjour in July 2001. 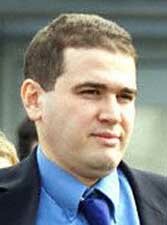 [US Congress, 7/24/2003 ] This unnamed individual may be Lofti Raissi, as several details match him perfectly. For instance, Raissi is a flight instructor who left the US in April 2000, is later accused of having shared an airplane with Hanjour in 1999, and is accused of being with Hanjour in July 2001. [Guardian, 1/31/2002] In addition, according to FBI investigators, Raissi engages in a number of suspicious activities during this period that will justify scrutiny after 9/11. For example, in June 2000, while training at a British flight school, he reportedly asks, “if a plane flies into a building, whether it is the responsibility of the airline or the pilot,” and warns that “America will get theirs.” [9/11 Commission, 1/5/2004] Raissi will be arrested in Britain after 9/11 and accused of training Hanjour and other hijackers how to fly, but the case against him will collapse in April 2002. He will be released, and many of the allegations against him will be withdrawn (see September 21, 2001). No media accounts will report that Raissi was mentioned in the Phoenix memo or wanted for an FBI investigation before 9/11. At the trial of al-Qaeda operatives accused of participating in the 1998 US African embassy bombings, it is disclosed that an unnamed al-Qaeda operative had requested information about air traffic control procedures. This information is provided to the FBI by a co-operating witness, L’Houssaine Kherchtou (see Summer 2000), and is mentioned by prosecutor Patrick Fitzgerald, who says that Kherchtou “observed an Egyptian person who was not a pilot debriefing a friend of his, Ihab Ali [Nawawi], about how air traffic control works and what people say over the air traffic control system, and it was his belief that there might have been a plan to send a pilot to Saudi Arabia or someone familiar with that to monitor the air traffic communications so they could possibly attack an airplane.” Nawawi is a Florida-based al-Qaeda operative and pilot who is arrested in 1999 (see May 18, 1999). The identity of the Egyptian is not disclosed, although both Kherchtou and Nawawi are associates of former Egyptian army officer Ali Mohamed, who used Kherchtou’s apartment to plot the Nairobi embassy bombing (see Late 1993-Late 1994 and January 1998). [United States of America v. Usama bin Laden, et al., Day 8, 2/21/2001] Mohamed also conducted surveillance of airports in the early 1980s with a view to hijacking an airliner, and subsequently worked as a security adviser to Egyptair, where he had access to the latest anti-hijacking measures. [Lance, 2006, pp. 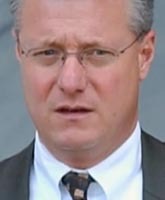 11-12] Jack Cloonan, one of the FBI agents who debriefed Kherchtou, will later receive the Phoenix Memo (see July 27, 2001 or Shortly After), which states that an inordinate amount of bin Laden-related individuals are learning to fly in the US (see July 10, 2001). [American Prospect, 6/19/2005] However, he will not apparently make the connection between the memo’s premise and the information from Kherchtou. Hani Hanjour, from a 2000 US visa application. [Source: 9/11 Commission]In January 2001, the Arizona flight school JetTech alerts the FAA about hijacker Hani Hanjour. No one at the school suspects Hanjour of terrorist intent, but they tell the FAA he lacks both the English and flying skills necessary for the commercial pilot’s license he has already obtained. For instance, he had taken classes at the University of Arizona but failed his English classes with a 0.26 grade point average. A JetTech flight school manager “couldn’t believe he had a commercial license of any kind with the skills that he had.” A former employee says, “I’m still to this day amazed that he could have flown into the Pentagon. He could not fly at all.” They also note he is an exceptionally poor student who does not seem to care about passing his courses. [New York Times, 5/4/2002; CBS News, 5/10/2002] An FAA official named John Anthony actually sits next to Hanjour in class and observes his skills. He suggests the use of a translator to help Hanjour pass, but the flight school points out that goes “against the rules that require a pilot to be able to write and speak English fluently before they even get their license.” [Associated Press, 5/10/2002] The FAA verifies that Hanjour’s 1999 pilot’s license is legitimate (see April 15, 1999), but takes no other action. However, his license should have been rejected because it had already expired in late 1999 when he failed to take a manadatory medical test. [Associated Press, 9/15/2001; CBS News, 5/10/2002] An Arizona FAA inspector later says, “There should have been a stop right then and there.” He will claim that federal law would have required Hanjour to be re-examined. [Associated Press, 6/13/2002] In February, Hanjour begins advanced simulator training, “a far more complicated task than he had faced in earning a commercial license.” [New York Times, 6/19/2002] The flight school again alerts the FAA about this and gives a total of five alerts about Hanjour, but no further action on him is taken. The FBI is not told about Hanjour. [CBS News, 5/10/2002] Ironically, in July 2001, Arizona FBI agent Ken Williams will recommend in a memo that the FBI liaison with local flight schools and keep track of suspicious activity by Middle Eastern students (see July 10, 2001). 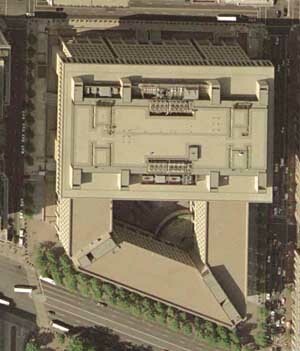 FBI headquarters. [Source: GlobeXplorer]FBI headquarters receives the Phoenix Memo, but does not act on it. The memo was drafted by Arizona FBI agent Ken Williams and warns that a large number of Islamic extremists are learning to fly in the US. It is dated 17 days earlier, but is not uploaded until this date (see July 10, 2001). Although the memo is addressed to eight specific agents, it is apparently not received by all of them. The Justice Department’s Office of Inspector General will later say that the memo was not delivered directly to the addressees, but uploaded to a central dispatching point, from where it was assigned to Radical Fundamentalist Unit agent Elizabeth Matson on July 30. Before sending the memo, Williams called both Matson and her colleague Fred Stremmel to talk to them about it. Matson pulls up the memo, which has “routine” precedence, and prints and reads it. However, she thinks it should go to the bin Laden unit. A week later she discusses the matter with bin Laden unit agent Jennifer Maitner and they agree that Maitner will do some research and then they will talk again. Matson will later tell the Office of Inspector General she may have mentioned the memo to her superior, but is not sure. Her superior will say he was not consulted. Maitner discusses the memo with bin Laden unit chief Rod Middleton and also sends it to the FBI’s Portland, Oregon, field office, which was previously interested in one of the men named in the memo. However, she does not do anything else with it before 9/11, apparently due to her high workload. The FBI will later acknowledge the memo did not receive the sufficient or timely analysis that it deserved. [US Department of Justice, 11/2004, pp. 65-77, 80 ] The memo is also seen by the FBI’s New York field office (see July 27, 2001 or Shortly After), another RFU agent researching the Moussaoui case (see August 22, 2001) and possibly the CIA’s bin Laden unit (see (July 27, 2001)). Lofti Raissi. [Source: Amnesty International]Lotfi Raissi, an Algerian pilot living in Britain, is arrested and accused of helping to train four of the hijackers. An FBI source says, “We believe he is by far the biggest find we have had so far. He is of crucial importance to us.” [Las Vegas Review-Journal, 9/29/2001] However, in April 2002, a judge dismisses all charges against him, calling the charges “tenuous.” US officials originally said, “They had video of him with Hani Hanjour, who allegedly piloted the plane that crashed into the Pentagon; records of phone conversations between the two men; evidence that they had flown a training plane together; and evidence that Raissi had met several of the hijackers in Las Vegas. It turned out, the British court found, that the video showed Raissi with his cousin, not Mr. Hanjour, that Raissi had mistakenly filled in his air training logbook and had never flown with Hanjour, and that Raissi and the hijackers were not in Las Vegas at the same time. The US authorities never presented any phone records showing conversations between Raissi and Hanjour. 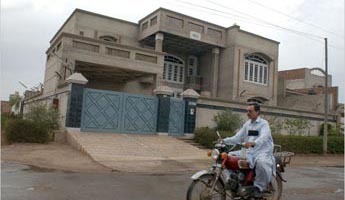 It appears that in this case the US authorities handed over all the information they had…” [Christian Science Monitor, 3/27/2002; Guardian, 9/26/2005] Raissi later says he will sue the British and American governments unless he is given a “widely publicized apology” for his months in prison and the assumption of “guilty until proven innocent.” [Reuters, 8/14/2002] In September 2003, he does sue both governments for $20 million. He also wins a undisclosed sum from the British tabloid Mail on Sunday for printing false charges against him. [Guardian, 9/16/2003; BBC, 10/7/2003; Arizona Republic, 10/14/2003] Declassified documents will later reveal that the British arrested Raissi only days after the FBI requested that the British discretely monitor and investigate him, not arrest him. [Guardian, 9/26/2005] Raissi perfectly matches the description of an individual mentioned in FBI agent Ken Williams’ “Phoenix memo” (see July 10, 2001), whom the FBI had attempted to investigate in May 2001 (see 1997-July 2001). FBI Director Robert Mueller launches a charm offensive to win over the 9/11 Commission and ensure that its recommendations are favorable to the bureau. Commission Initially Favored Break-Up - The attempt is greatly needed, as the Commission initially has an unfavorable view of the FBI due to its very public failings before 9/11: the Phoenix memo (see July 10, 2001), the fact that two of the hijackers lived with an FBI counterterrorism informer (see May 10-Mid-December 2000), and the failure to search Zacarias Moussaoui’s belongings (see August 16, 2001). Commissioner John Lehman will say that at the start of the investigation he thought “it was a no-brainer that we should go to an MI5,” the British domestic intelligence service, which would entail taking counterterrorism away from the bureau. Lobbying Campaign - Author Philip Shenon will say that the campaign against the commissioners “could not have been more aggressive,” because Mueller was “in their faces, literally.” Mueller says he will open his schedule to them at a moment’s notice and returns their calls within minutes. He pays so much attention to the commissioners that some of them begin to regard it as harassment and chairman Tom Kean tells his secretaries to turn away Mueller’s repeated invitations for a meal. Mueller even opens the FBI’s investigatory files to the Commission, giving its investigators unrestricted access to a special FBI building housing the files. He also gets Dame Eliza Manningham-Buller, head of MI5, to meet the commissioners and intercede for the bureau.